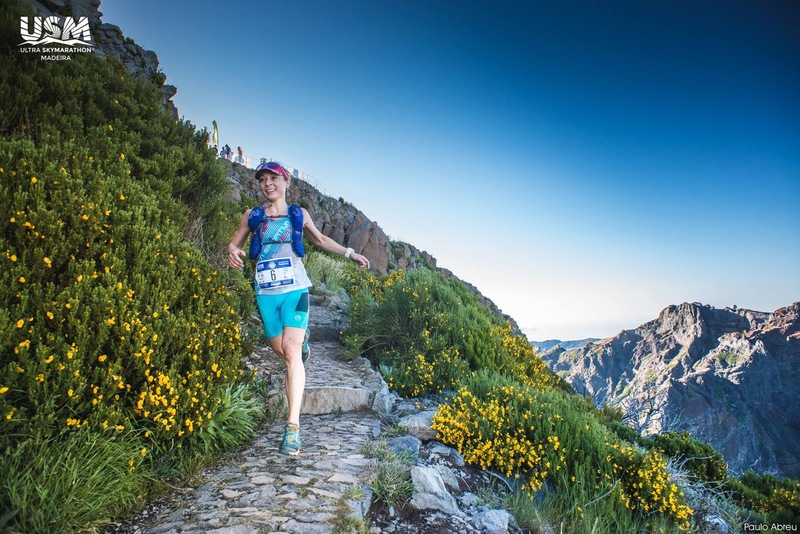 Ultra SkyMarathon Madeira 55km (USM) is the second race in the Skyrunning World Series and takes place on a lush little island off the northwest coast of Africa. This years race included a star-studded field of international competition. Six of us women finished under the previous course record set by Stevie Kremer in 2015. This is a recap of my experience on the beautiful island. Here the land grows boldly from the ocean up to the denticulate emerald edges of the central ridge reaching heavenward from the Atlantic. Below, the northern coast is comprised of flourishing vineyards. Peach-colored stucco and stone buildings topped with clay shingles pop from contrasting rows upon rows of verdant grapes. The vegetation is brilliantly ornamented with florescent flowers. The land is peaceful except for sounds of birds in the morning and crickets at night. Through the winding paths, the rustling of lizards can be heard scurrying amongst leaves, and frogs croak from pools of runoff preserved for irrigation. Ancient cobbled paths cross the mountains through humid laurel forest connecting the isolated north coast to the bustling port capital Funchal to the south. Prior to asphalted roads that appeared in the last twenty years, men would use these cobbled caminos to carry nearly 50kg of wine in goat skins, balanced on their shoulders, up and over the steep, slippery paths to where ships could port and carry the fermented juice to faraway lands. “In America, the signing of the Declaration of Independence was toasted with Madeira wine!” A Blandy’s wine tasting guide at Quinta do Furão in Santana tells us patrons. Truly, these wines are unique and range from very dry to highly sweet with a strong, biting flavor more characteristic of liquor than typical Spanish wine. Often mixed with lemon juice for an evening cocktail, the wine is a venerable Madeira cultural experience. Below Santana, Madeira’s severe coastal bluffs contrast with a cool, refreshing aquamarine blue of the crashing ocean. These warm, humid coasts grow steeply up 1325m into ridge lines only 7.2km inland (about 4500 feet in 4.5 miles). USM starts appropriately early so runners reach the greatest point, Pico Ruivo as the tangerine sunrise rises over a puffy blanket of cloudy forest below. Runners ascend to areas requiring rock scrambling and ropes for assistance. Descending the challenging paths requires focused navigation of rocks and roots despite the distracting allure of surrounding vistas. The vegetation varies from the lustrous, wet leaves of subtropical forests below up to sunny, open fields of heather on higher ridges. A section of land is covered with the gray remnants of a fire scar from the 1990s, but these plants stay alive at the roots and grow back, a fire adapted species. The course dips into the Parque Natural de Madeira (Madeira Natural Park), the home of the largest surviving laurel forest in the world. Race organizer, João Clode explains this is a unique ecosystem, deemed a World Heritage Site by the United Nations Educational, Scientific, and Cultural Organization (UNESCO). Clode is a postdoctoral researcher of biology at the Institute of Marine Research at the University of the Azores and worked previously for the Smithsonian Environmental Research Center in America. For Clode, showing this unique landscape to runners from all over the world is one of many highlights to this special event. The race course descends out of the mountains on paths touring the villages, winding through neighborhoods and vineyards, back to the ocean and even through a river bed before climbing again to the town of Santana. Men and women from the island diligently work their land, occasionally glancing up with a smile from their quiet labor. Madeira’s culture seems to be fully grounded in hard work and hope, a heartwarming combination to inspire runners pressing onward through the difficult slopes. Every turn is carefully marked or attended by cheerful volunteers. Finally, the finish line is enthusiastically managed by Depa, the world famous speaker from Transvulcania in the Canary Islands. Hundreds of runners, volunteers and spectators congregate the next afternoon for awards that dip deep into the top levels and age groups of every event. Every runner is celebrated with a generous finisher award. Madeira is an admirable gem, but the Ultra SkyMarathon Madeira is a living jewel of the Skyrunning collection of races. Hillary Allen, Martina Valmassoi, Anna Frost, K.Pat. photo: Ron Braselton, Sr.
women’s podium. photo: Ron Braselton Sr.